The American Library in Paris is proud to be the organizer of the Young Authors Fiction Festival (YAFF). The YAFF is a the only creative writing intiative that aims to strengthen community among English-speakers in the Paris area through the art and craft of storytelling. The Library believes that creative writing plays an important role in a child’s literacy development. Creative writing is fun and a great tool to help broaden a child’s imagination and foster a life-long love of reading and writing. The YAFF is free of charge and open to all students ages 5-18 in the greater Paris area who write in English. The Young Authors Fiction Festival originated as The Red Wheelbarrow Writing Contest, which began in 2001 with l’Ecole Massillon and a handful of Paris-based members of the Society of Children’s Book Writers and Illustrators (SCBWI), who acted as judges. YAFF is now a highlight of Library programming and the only creative writing initiative for children in Paris, with 450 entries (and growing each year!) submitted from more than 25 schools and writing programs. The YAFF team consists of Library staff and volunteers and includes the involvement of 60 judges from the Library’s community and beyond. We encourage parents, teachers, educators, and schools to help nurture and develop a passion and practice for creative writing in children. The Library offers many resources for creative writing, including books, creative games, and writing workshops offered many times throughout the year. Together, and with YAFF, the Library hopes to raise and nurture the next generation of writers and authors! 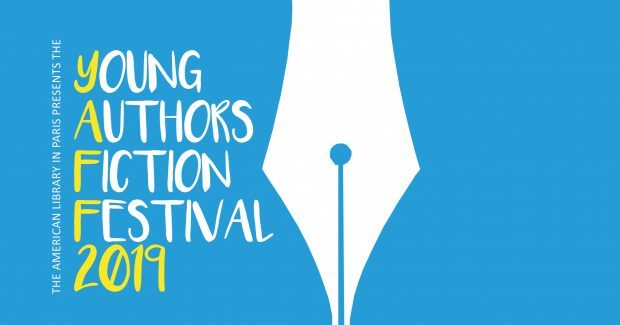 The deadline for the 2019 Young Authors Fiction festival has passed. The deadline for submission was 1 April by 22h00 and submission was open online until then. Submission is now closed. The 2019 Flyer and Submission Guidelines are available here. For questions, contact the YAFF Team at yaff@americanlibraryinparis.org. For a full list of all the 2018 YAFF winners, read the Library blog or check out the 2018 YAFF Celebration Booklet from the Library collection. For more photos from the 2018 Celebration Event, check them out on the Library Flickr. I'm a teacher, what can I do to promote the Young Authors Fiction Festival ? Spread the word about the YAFF among students and staff at your school and encourage them to participate. Paper your school/institution, library or bookstore with the YAFF Flyer and Guidelines. Please forward this events page to all other teachers you know for more details. Note that the deadline is on 1 April 2019 at 22h00. If you are a teacher and would like to support YAFF by judging for the festival please contact yaff@americanlibraryinparis.org for information. ONE (1) original story per student written between 1 April 2018 and 31 March 2019. Be typed, using Times New Roman or Arial fonts, 12 point, double-spaced, with one-inch (2.5 cm) margins. No handwritten work, illustrations or color print, in a .DOC format. No PDF files allowed. Submitted by the deadline of 1 April 2019 by 22h00. Stories that do not meet these criteria will not be entered into the Festival. The YAFF Submissions team will check stories before they are entered into the Festival. If a story does not meet the guidelines, the author may be given time to make any necessary changes but only if there is ample time before the deadline. If there is no time to make changes the story will not be entered into the Festival. A PDF of the guidelines can be downloaded here. What is the cost of entering YAFF ? The Young Authors Fiction Festival is absolutely free of charge to enter. Can I submit my story after deadline ? All qualifying entries must be submitted by 1 April 2019 at 22h00. Will you accept a story that is over the word count ? Do the story title and page numbers count towards the word count ? No, only the body text count towards the word count. How does YAFF define an "original story" ? Each submission to YAFF must be original: the participant must come up with the content and write the story on their own. Parents and teachers are encouraged to help only insofar as they create “teachable moments”, e.g., guiding young writers through revisions by asking questions instead of giving answers. For example, asking “can you express this idea in fewer words?” to help a child write more concisely or “we can look that word up in the dictionary” for spelling help. Fan-fiction or using another authors characters or setting is not deemed as original work. Any stories not deemed as original work will not be eligible for top honors or publication. We require that all students pledge on their honor that their submission is their own original work. Can parents or teachers proofread submissions ? Part of the objective of YAFF is to help young people develop new skills and a deeper understanding of the English language. We like to avoid, if at all possible, that parents or teachers correct the “mistakes” for the students. But neither do we want teachers/parents to have so light a touch that a potentially good story submission doesn’t make the grade due to issues that might easily have been improved upon, while teaching new skills at the same time. Can parents type up stories on behalf of their young children ? We suggest that parents have young children write out their story, then type it up for them including any spelling or grammar mistakes. That way the story that is submitted is indeed the original work of the child. Can teachers submit one or more entries on behalf of their students ? Absolutely! Please make sure to submit each student’s story as a separate entry. For each student please complete the online submission form with the student’s and their parents’ contact information. Teacher’s cannot give permission for their students’ photos to be taken or their stories to be published only parents have the authority to do this. Please keep this in mind when completing the submission form. If a teacher completes the form for a student we will contact the parent to ask for their permission so it is important we have their contact details. I’m confused about the French and American grade levels. Which do I use ? How do I know that you have received my submission ? The YAFF team will send an e-mail within a few days after submitting your story, letting you know if the story meets the YAFF guidelines. (If it doesn’t, then we’ll offer some suggestions to help you modify it). If you don’t receive an e-mail within one week, please contact the YAFF team at yaff@americanlibraryinparis.org. Does my consent for my child’s name, story or picture to be used to promote the festival affect his/her submission ? Not at all. All stories are judged independently of entry information except for the title of the story and the age / grade of the author. At the Celebration Event photos are taken of the winners to be used on the Library website announcing the Festival winners. If you do not give permission for your children’s photo to be taken we will ensure their photo is not take at the event. The winning stories are published in a YAFF Celebration Booklet which is added to the Library collection and is available for purchase at the Celebration Event. The Library also publishes some of the winning stories on the Library website. If you do not give permission for your child’s story to be published, then if they come in 1st -5th place then their story will not be included in the Celebration Booklet or published online. Please keep this in mind when giving or withholding your permission for your child’s photo and story. What are the prizes for the winners of the YAFF ? The goal of YAFF is to encourage and support children and young adults to complete a creative written project. The winning stories from 1st -5th from each grade are published in a YAFF Celebration Booklet by the Library. The Celebration Booklet is added to the Library collection and is available to purchase at the Celebration Event. All participants of YAFF are invited to attend the Celebration Event normally scheduled in mid-June, where we honor all the writers and announce the winners of the YAFF. Is there an award ceremony for the winners ? YAFF culminates in a Celebration Event at the American Library in Paris in mid June. Details of the 2019 YAFF Celebration Event will be announced in March 2019. At the YAFF Celebration Event we honor all participating authors and burgeoning storytellers as well as announce the finalists. Finalists will be notified prior to the event, but all young authors are encouraged to attend this celebration of writing for youth and children. How can I support YAFF? YAFF is free of charge to enter. To keep the Festival free the Library relies on a large amount of volunteers to help run YAFF. In 2018 we had 70 volunteer judges to read the 450+ submitted stories. We are extremely grateful to them for dedicating their free time to YAFF. The YAFF submission team is also made up of volunteers with a Library staff member coordinating YAFF. If you are interested in supporting YAFF and would like to volunteer your time as a judge or member of the YAFF team please contact yaff@americanlibraryinparis.org with your details, any experience you have with children and/or writing and why you would like to judge or help with the festival. You can also support YAFF in other ways if you are unable to judge, so if you would like to contribute your time and talents please get in touch. We always need more judges and other help and to support YAFF.